Online preliminaries were held in August, and determined the top five players from different countries. They were invited to Mexico City, with all expenses paid, to compete in the final stage. In addition to Ye and Velasco, Fernando Aguilar of Argentina (who had to cancel due to family complications), Alfonso Artique of Uruguay, Abner Turkieltaub Melo of Chile, and Orlando Trujillo of Cuba (by invitation) were the finalists. As the host country, Mexico was excluded from the online qualifier and received a seeded seat into the finals. The Korean Cultural Center in Mexico held a separate online qualifier for Mexican players, which was won by Abraham Florencia, a high-dan player who placed 8th at the World Amateur Go Championships earlier in the year. A great amount of attention was focused on the game between Ye (black) and Velasco (white). Velasco had a strong opening and held a large territorial lead until a detrimental mistake in the middle-game. Ye successfully seized the opportunity and killed a large group, ultimately securing a win-by-resignation. After the tournament, the game was displayed on a projector in the background and was reviewed by Ryu. 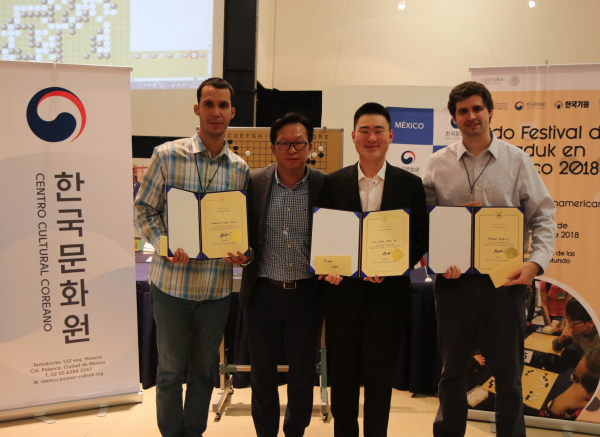 The event was sponsored by the Embassy of the Republic of Korea and the Korean Cultural Center in Mexico, with the valuable support of the National Museum of World Cultures, the Korean Baduk Association, the Tygem Go Server, the Korean Sports Promotion Organization, and the Ministry of Culture, Sports and Tourism. For more pictures, click here. -Paul Barchilon, E-J Youth Editor. Photo by Korean Cultural Center in Mexico photographer Seol Ha Kim.